• Lightweight enclosure of metallic or non-metallic construction. • Not designed to withstand an internal explosion. • Enclosure must be tightly sealed and gasketed such that it is prevented from breathing normally. • The amount of gas allowed to penetrate the enclosure is insufficient to reach the Lower Explosive Limit (LEL) otherwise an explosion could occur. • An optional facility for the testing of the Restricted Breathing properties of the enclosure may be provided for routine testing after installation on site. Not all Ex d, or Ex e, or Dual Certified (Ex d & Ex e) cable glands are able to meet the Ex nR Restricted Breathing test conditions. It would be incorrect therefore to assume compatibility requirements for all protection forms in Zone 1 and Zone 2 areas, are always met by a 'standard' cable gland. Hence it is necessary to verify that the intended cable glands are suitable for the application, especially in this safety critical area. 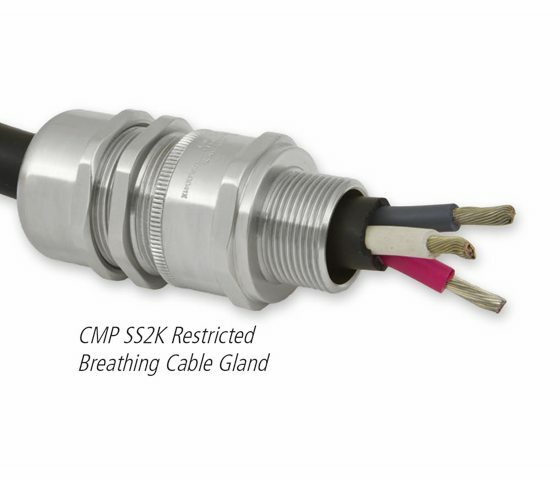 CMP Products has Restricted Breathing type ‘nR’ (Ex nR) approval for a range of its cable glands certified to IEC 60079-15.